Pasta is synonymous with Italy and despite theories that suggest it was brought to Italy from China by Marco Polo in the 13th century, its Italian origins go back much earlier than that. It’s now more widely accepted that pasta in Italy dates back to Etruscan times (1st century AD) when the Romans ruled the area we now call Italy. The kind of pasta that existed was known as “lagane” (where the term for modern day lasagna comes from), but it was baked instead of being boiled in water. Pasta in its modern form is thought to have been brought to the southern part of Italy, in particular to Sicily, by Arabian invaders and then settlers from the 8th century onwards. The first term for pasta was “macaroni” which in Sicilian meant “kneading dough with energy”. From a process that used to take almost a whole day to complete hundreds of years ago, pasta has now become one of the quickest and easiest recipes to make! The recipe I am sharing with you today should only take you about an hour to complete (and that’s including resting time for the dough!). Try making the real stuff next time you feel like a delicious pasta dish, the taste is worth it! Place the flour and semolina in a mixing bowl, make a well in the center and crack the eggs into it. Using your finger tips, mix the eggs with flour a little at a time until everything is combined. Knead well until all the ingredients combined and give you one smooth pasta dough! You can use a food processor if you’ve got one, just put everything in and mix until combined. Once you’ve made the pasta dough, you need to knead it to work the gluten in the flour to make your pasta springy and not flabby! Knead it until it feels smooth, then wrap it in cling film and rest it for 30 minutes in the fridge. Dust the bench with “00” flour and set the machine to the widest setting. Take a piece of dough and flatten it slightly with a rolling pin, then feed it through the machine, if it sticks a little slightly dust the pasta with flour. Change the machine down a setting and roll the pasta through again. 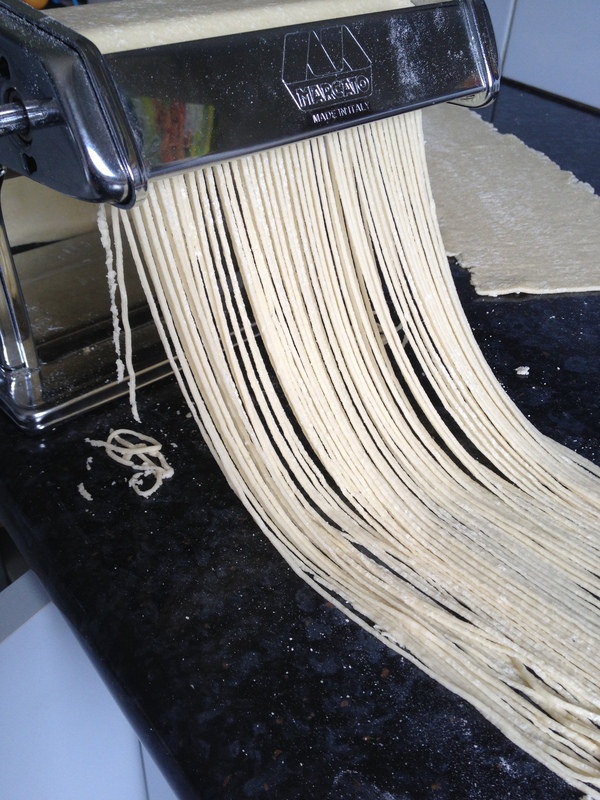 Fold the pasta in half, change the machine back to the widest setting and roll the pasta through again. Repeat this process until the dough become really smooth(3-4 times). 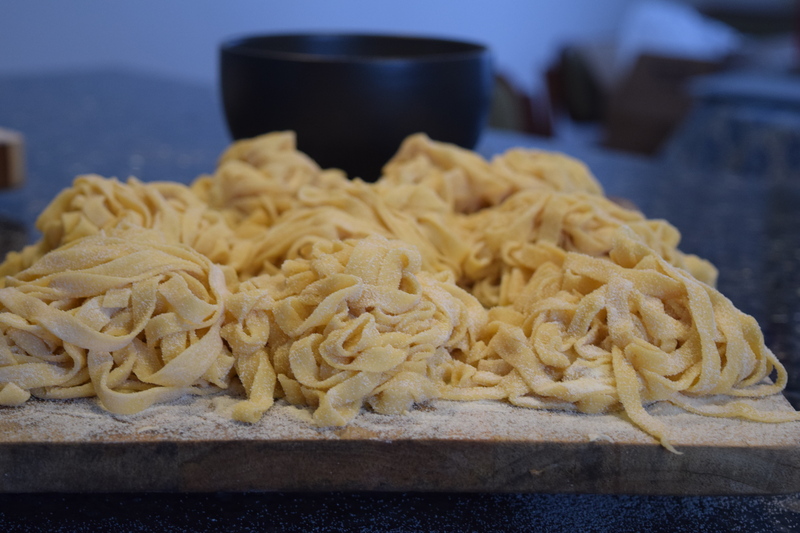 Once you’ve made the pasta you need to cut it or shape straight away because fresh pasta dries quicker than you might think, so don’t leave it on the bench for too long or you can cover it with a damp cloth which will prevent it from drying! 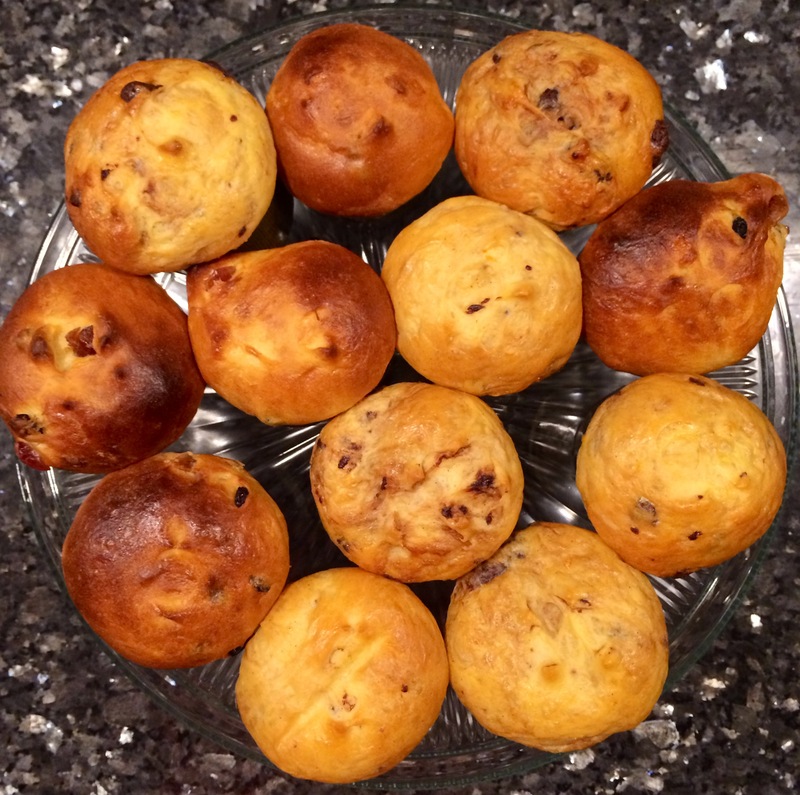 Panettone is a traditional Italian Christmas cake, which hails from the city of Milan. Despite having some Italian ancestry myself, I’d never tried this light and fluffy cake loaf. Madame Fermier on the other hand, couldn’t celebrate Christmas without it, and so I was introduced to this breakfast come dessert by her family and now, I couldn’t go without it either. Traditionally in Italy it’s taken with a side of limoncello as more of an after meal dessert, but I love mine with a side of freshly brewed black coffee for breakfast – perfect for Christmas morning while unwrapping gifts! They make great gifts too, and you can even buy molds in mini-versions for a one-serve wonder. To make a starter sprinkle 1 packet of dry yeast over the warm water in a small bowl and let it dissolve. Then mix through 60g of flour, cover with cling film and leave it to rest until it doubles in size. Dice the butter and combine it with the remaining the flour. With the tip of your fingers mix them together until you have a sand-like mixture. Add the starter to the egg mixture and whisk on medium speed until well combine. Slowly add the butter/flour mix and knead on high speed until the dough become slightly elastic, then add the mixed peels, cherries and raisins, mix well until combined. Form a uniform ball and place it in a slightly oiled bowl, brush the top with vegetable oil, loosely cover with glad wrap and leave to rest until it triple in size (about 2-2 ½ hours in a warm place). Take the dough out of the bowl and put it on a lightly floured bench. Divide it into 70g portions for mini Panettone or 800g for big ones. Lightly spray the mold and place a ball in each one. Loosely cover with glad wrap and leave to rest until double in size (about 1 ½ hours for the minis 2 ½ for the big ones). In the mean time preheat the oven at 200 degrees Celsius (392 F). With oiled scissors, cut a cross on top of the Panetone. Gently brush them with egg wash (2 eggs whisked with 50mL milk). Bake for 9 minutes at 200 degrees and then a further 9 minutes at 180 (350 F) for the mini ones. For the big Panettone, bake for 10 minutes at 200 degrees, and a further 20 minutes at 180 degrees Celsius. Use a skewer to know if it’s cooked, if it comes out clean when you pick through the Panettone then it’s ready! Once cooked place them on a cooling rack. Serve with fresh coffee for a Christmas morning breakfast treat or as dessert with a glass of Limoncello after a delicious Christmas lunch or dinner. 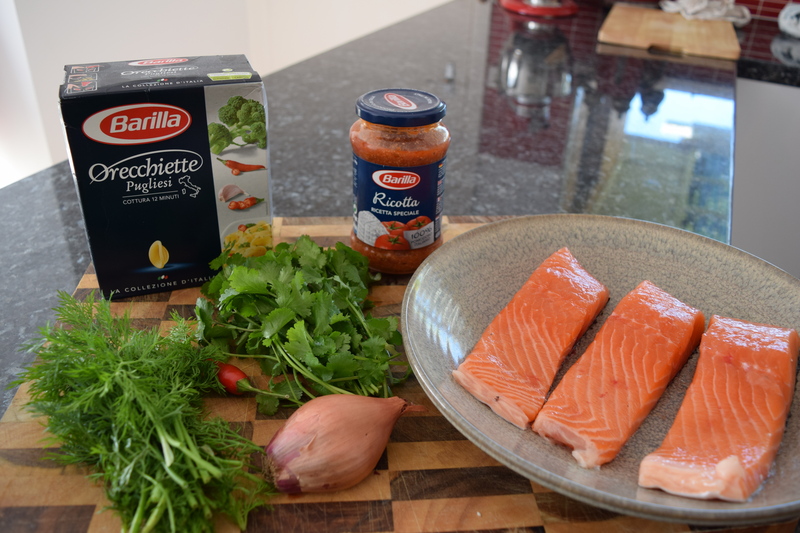 The wonderful team at Barilla has treated me again with a sneak preview of some of their latest products. This time it’s their new pasta bake range which is fantastic for those casual dinners with family or friends as it’s hearty, cost effective and most importantly, delicious! Some pasta bakes can be quite heavy on the cheese so I’ve kept this one lighter by only using parmesan cheese as the very top layer to add a nice crust as opposed to stirring a cheese all the way through. Put a large pot of water on the stove for the pasta and preheat the oven to 200 degrees Celsius. Cook the pasta in salted boiling water for 8 minutes, then drain and keep aside. Peel and dice the onions, crush the garlic, chop the thyme and rosemary. Roughly dice the pancetta and keep aside. Preheat a metal roasting tray on the stovetop on a medium heat. Cook the onions and garlic for about 5 minutes, and then add the thyme, rosemary and pancetta. Cook for a further 5 minutes. Add the paprika and lamb spice, stir, and cook for a couple of minutes. 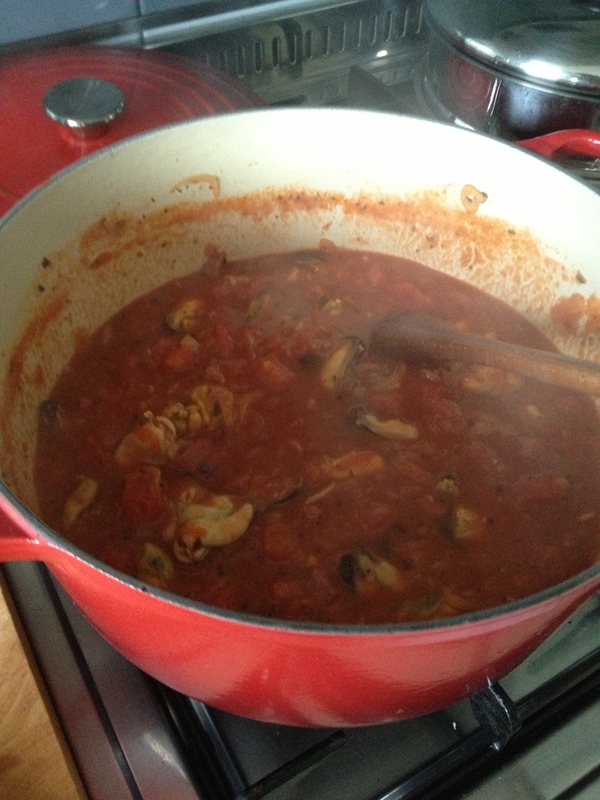 Add the red wines and reduce by about ¼. Add the lamb mince and cook until brown, making sure you don’t have any big lumps. Add the Barilla cheese and tomato sauce and the crushed tomatoes and 150mL water, stir then add the cooked Barilla Casarecce pasta, mix well and top with the grated parmigiano reggiano and bake in the hot oven for 15 minutes covered with foil, and then 5 minutes without it. With this wonderful dish I recommend a Château “Falfas” AOC Cote de Bourg available from www.airoldifinewines.com.au . Pasta is a staple food of traditional Italian cuisine, with the first reference dating to 1154 in Sicily It is also commonly used to refer to the variety of pasta dishes. Typically pasta is made from an unleavened dough of a durum wheat flour mixed with water and formed into sheets or various shapes, then cooked and served in any number of dishes. It can be made with flour from other cereals or grains, and eggs may be used instead of water. 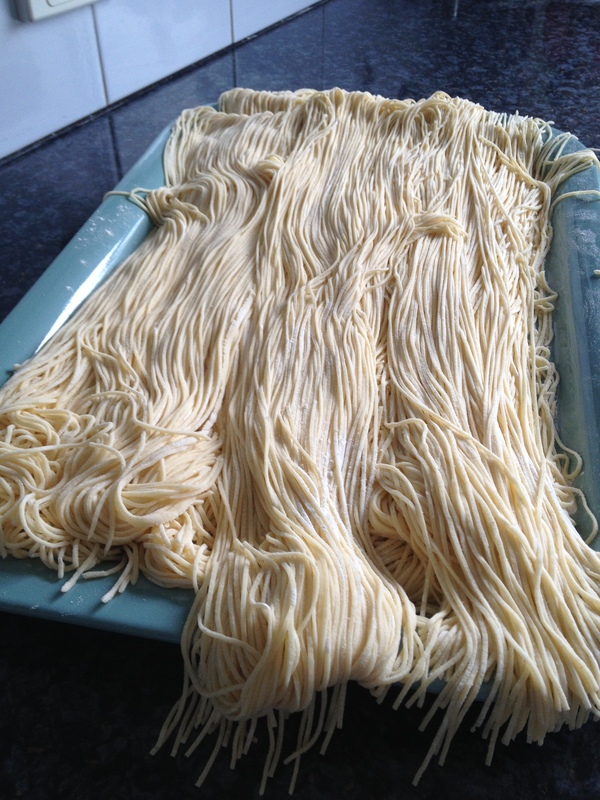 Pastas may be divided into two broad categories, dried (pasta secca) and fresh (pasta fresca). Chicken eggs frequently dominate as the source of the liquid component in fresh pasta. Both dried and fresh pasta come in a number of shapes and varieties, with 310 specific forms known variably by over 1300 names having been documented. In Italy the names of specific pasta shapes or types often vary with locale. For example the form cavatelli is known by 28 different names depending on region and town. Common forms of pasta include long shapes, short shapes, tubes, flat shapes and sheets, miniature soup shapes, filled or stuffed, and specialty or decorative shapes. Method: Take the skin off the salmon and slice it into strips. Wash and fine chop the herbs, finely dice the shallot, chili, crush the garlic and zest the lemon.Sear the marinated salmon in a smoking hot pan for about 10 seconds on each sides, reduce the heat to medium then add the rest of the garnish and the ricotta sauce, toss the ingredients together and add the orecchiette. Season to taste and serve. 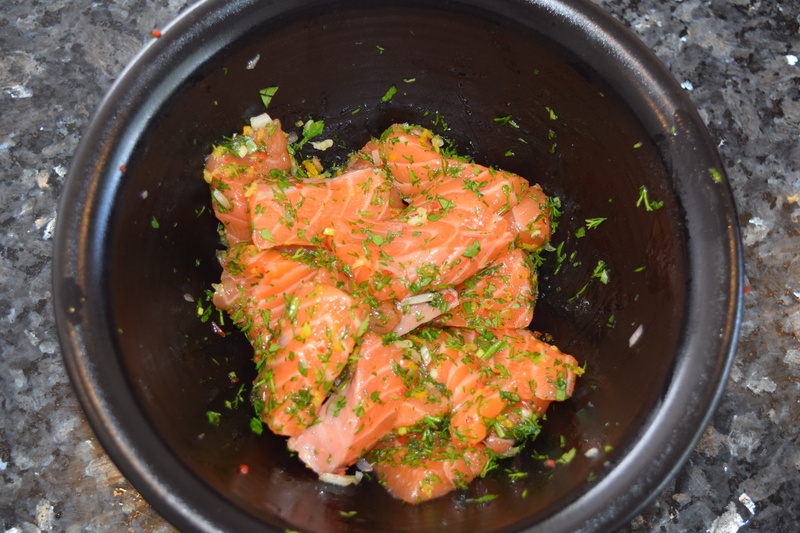 Le FermierBon appétitPut the salmon into a bowl and add your garnish to it, mix it well and let it marinate for about 10 minutes. 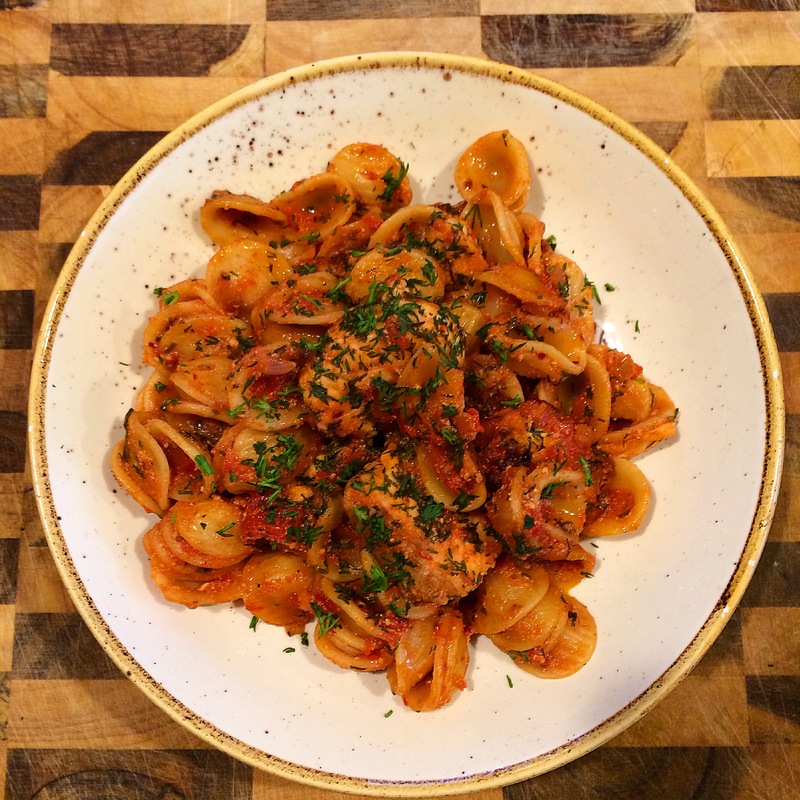 Sear the marinated salmon in a smoking hot pan for about 10 seconds on each sides, reduce the heat to medium then add the rest of the garnish and the ricotta sauce, toss the ingredients together, bring the sauce to the boil and add the orecchiette. Season to taste and serve. You can also check my social media on instagram and twitter @le_fermier. 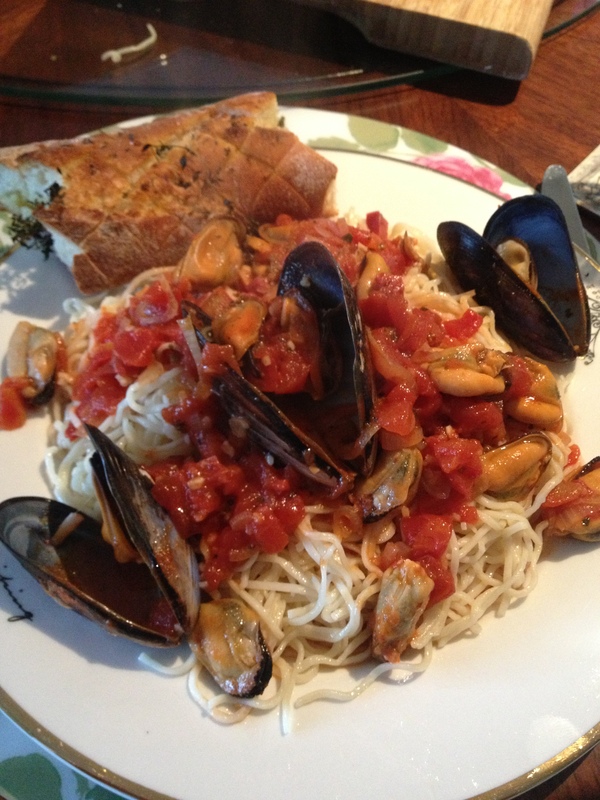 Mussels with a Mediterranean twist, in this recipe I’ve add a little bit of spicy salami which I think gives it that extra “kick”, that meaty and spicy flavour goes hand in hand with the mussels, and that soft and succulent texture from the homemade fresh spaghetti is just amazing. Together they create an amazing dish. Method : Mix semolina, plain flour, & salt together • Whisk the eggs then add them to the semolina, then add the water and olive oil and mix until combined • Cut the dough into small pieces • Roll the dough with a rolling pin until thin enough to put through the pasta machine • Starts rolling on number 1 to 4 then fold the dough on itself and start again from number 1 to 7 • Roll the dough through the spaghetti attachment of the pasta machine and lay the pasta on a flat dry tray and sprinkle with semolina to avoid sticking • Cook in salted boiling water for 2 minutes, drain the water from the pot, refresh the pasta by rinsing in cold water and drain again • Drizzle a little olive oil over the pasta to avoid sticking. Method : With a small knife remove the “ beard” on the mussels and scratch any residue on the mussels and rinse them quickly under cold water• Heat up you pot on a high heat, pour the white wine and turn the heat down to medium then add your mussels and cover, cook until the mussels open up• Once opened pour the mussels and juice in a bowl, keep aside about 10 mussels in the shell for presentation later, take the rest out of the shell and keep the juice for the sauce• Heat up a pot, add a drizzle of olive oil. 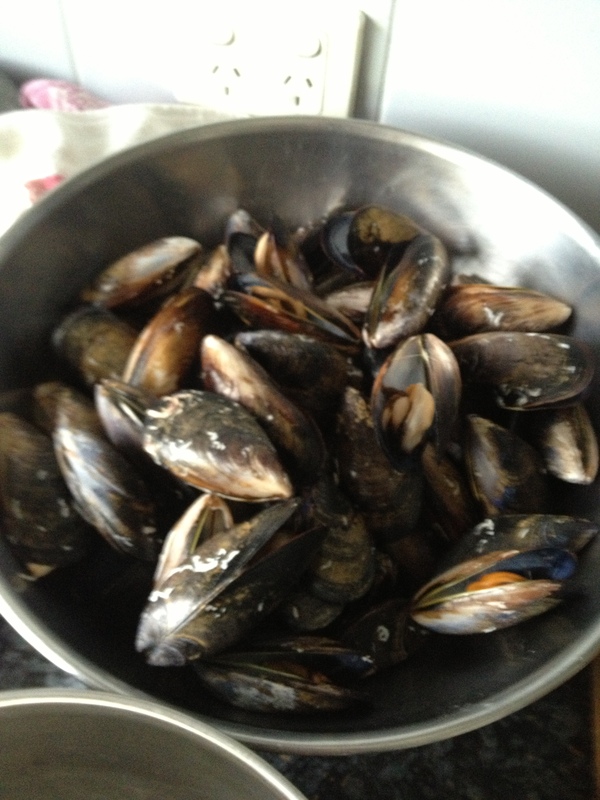 Add the diced onions, crushed garlic, thyme, diced salami and chopped dried chili and cook on medium heat for about 5 minutes• Add the shelled mussels and stir, strain the mussel juice using a fine strainer then add half into the pot. 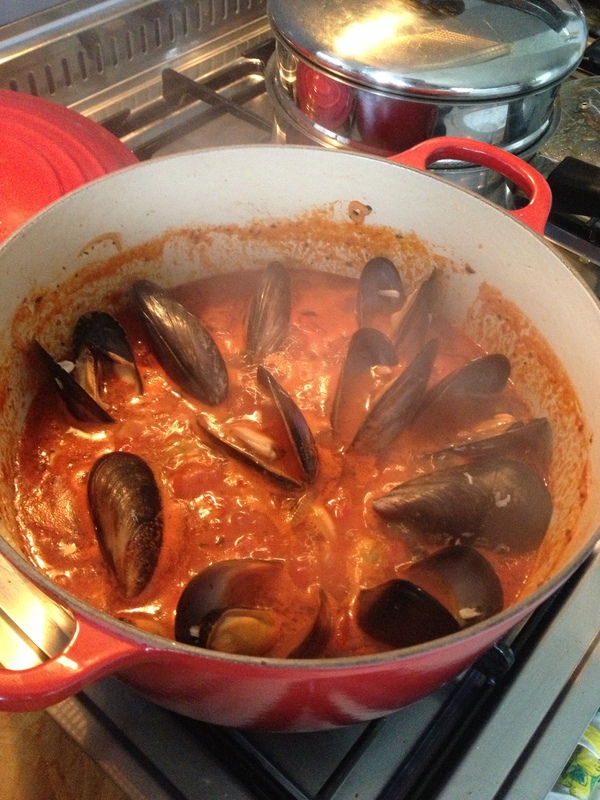 Add the crushed tomato and cook for about 8-10 minutes on a low heat• Add the remaining mussels on top and season to taste.